At the the mysterious town of Rennes Chateau in France is a tower called the Tour Magdala. It is named after Saint Mary Magdalene. It is said that Migdal Israel was where Mary Magdalene was born. Migdal means tower and it is where a ancient synagogue was discovered . Abbe Sauniere had his study or library in the Tour Magdala. The tower architecture is decorated with trefoils. The book cases in the library have trefoils carved in them. It is where Sauniere kept his books. Trefoils,Clubs, Clover, or Trefoil knot represents the Trinity. A chimney on the roof of the Tour Magdala has a trefoil cut out. 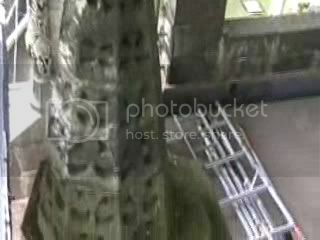 It is said through the trefoil one can see Pech Cardou but I hope to have someone next month confirm this sighting. The trefoils are in the windows of the Tour Magdala. It seems Sauniere enjoyed the Celtic and Christian symbol of the Trefoil. It has ancient symbolism throughout many religions. It was at the Tour of Magdala Sauniere collapsed on January 17 1917 and then died on January 22,1917. 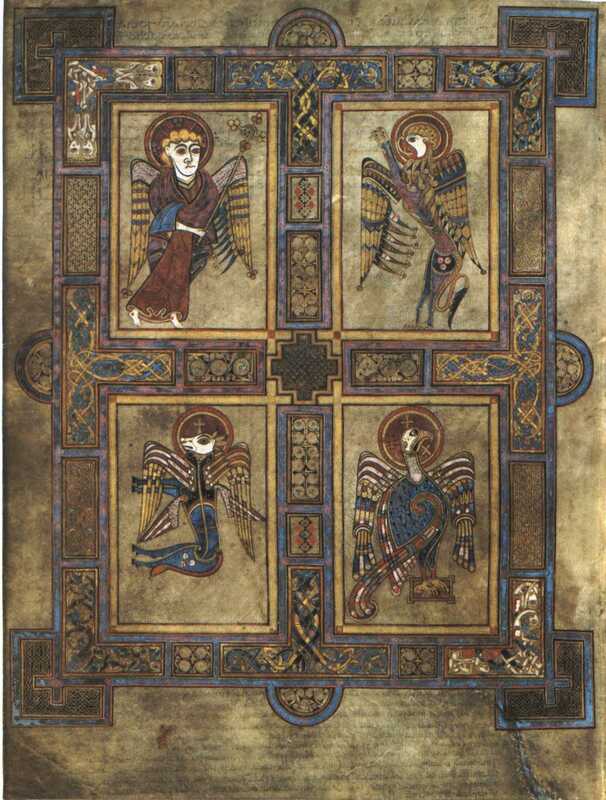 In the Book of Kells the angel carries the budding rod of Aaron which are trefoils. In precise mathematical language, a knot is an embedding of a circle in 3-dimensional Eucleidian space. Aarons rod was a rod depicted with a flower with three leaves. It looked like the clover which Saint Patrick used to convert the pagan Irish to Christianity. He used it to explain the Trinity. The Irish had their own pagan trinity. One was with the triple goddess and the other was the thrice born. They believed in reincarnation. In one of the oldest Christian churches in France and built by the Merovingians. Baptistere Saint Jean at Poitiers. It shows Emperor Constantine carrying a rod with a trefoil on it. The name clover derives from clave trinodis which was the name of Heracles' warclub, made from tree with three large roots. This is also why the clover-shape on playing cards are called "clubs." The club represents the number three. It is the first number according to Pythagoreans and the first male number. The club represented the acorn in French cards. The Parisian cards developed historical and mythical names for the King, Queen, and Knight cards. The Queen of clubs was called Argine which was an anagram for regina meaning Queen. Argea was mother to Argos who is connected to Jason and the Argonauts. Tour Magdala with its trefoils/clubs is the symbol of the Queen's tower. If you look at the design of the Queen of clubs playing card one sees a black and white tower in the design. The Jack/Knight of clubs carries the eight pointed star which looks like the floor pattern in the Tour Magdala. The Tower card in Tarot is number sixteen. Which is 8 +8 = 16. The floor of the Tour Magdala was torn up by an excavation team only to be stopped and found a piece of wood. One tile is reported by Andrew Gough to point the way to the spiral staircase and to a window of the view of the Grotto named Mary Magdalene burial site. If you want more information please read the link below an article by Andrew Gough. The eight pointed star is known as the Queen of Heaven's star or Isis star. The eight pointed star was the Templars code word for the Holy Grail. It is interesting that the Knight of Clubs Lancelot is a major player in the story of the Holy Grail. The floor pattern looks similar to a variant of the Koch Snowflake. The Koch Snowflake fractal which appeared as a crop circle has six points. Another fractal can be made by the fleury cross which is the sign for infinity which can be seen at Rosslyn chapel on the grave stone of William De Saint Clair. At Rosslyn Chapel is the steeples on the roof which have clubs,diamonds,hearts, and spades. The trefoil has it's connection with the three petals of the fleur de lis. The fleur de lis was taken by King Clovis the Merovingian king as his symbol. In the library at Tour Magdala was a book owned by Sauniere by Camille Flammarion. A astronomer who believed life existed on Mars. He believed that there was something past the universe man saw. This picture depicts this idea. As the telescopes look deeper and deeper into the universe Flammarion may be proved right something exists even past the Big Bang. Sauniere's library had a room with a view. Who knows the Hubble telescope may one day see Ezekiel's wheel within a wheel which causes the movement of the universe. A friend of mine will be going to Rennes Chateau and will look through the Trefoil/Club on the rooftop of Tour Magdala. I will let you all know what he sees. WILL CHINA'S MOON ROVER CROSS INTO THE MOON'S FORBIDDEN ZONES?